This feature enables you to set up a default printer destination by report and user, and will retain the printer setup from the previous session. In Elliott, the default is by report and workstation. The system will support 9 local and 36 network printers (using the letters of the alphabet). It will display the user name on the spooled reports. 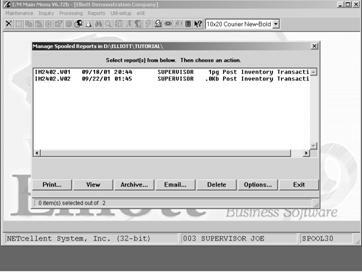 There is an optional security control setup which only allows you to access the spooled reports you printed. You can also define 10 supervisors who are not subject to this security control. 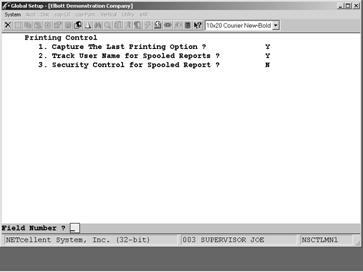 Since different reports might have different printer destinations, it is not appropriate to apply the same printer destination default for all the reports. For instance, printer destinations for invoices are obviously different from printer destinations for labels. Our enhancement resolves this problem by allowing you to define your own printer destination default. Even though the printer defaults are not very important, since you can always override them, it is definitely convenient to have the proper printer defaults so you do not have to change it each time you want to print something. Field 1. Capture The Last Printing Option? Answer “Y” to save the previous printing session. 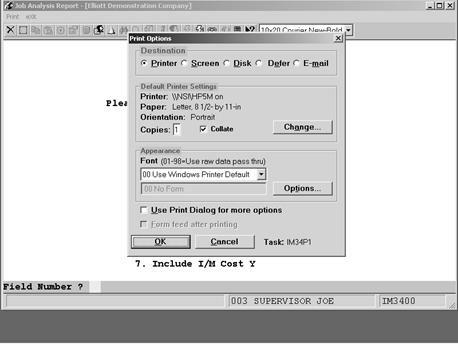 For example, if you print an Invoice to an HP LaserJet 4 and select a specific font, the next time you print an invoice the system will maintain the same printer and settings. Field 2. Track User Name for Spooled Reports? Answer “Y” if you wish to print the user name on the spooled reports. Field 3. Security Control for Spooled Report? If you wish to set security controls when spooling reports, set this to flag to “Y”. By doing this, users can only access the report they spooled. 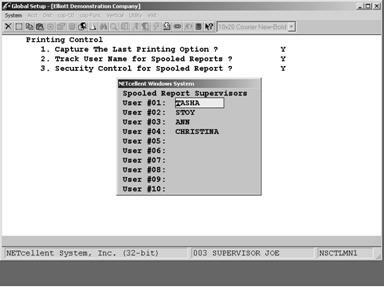 You can define 10 supervisors that can view and print all spooled reports. See figure below.